As the year draws to an end, 2018 was not a year of living dangerously, as most of us mere mortals want more than ever to live a quiet life. The year has also not been easy for any leader, as Theresa May knows all too well. Since the great recession of 2008, competition has been a race to the bottom in almost every sphere, but more so in politics. As competition guru professor Michael Porter wrote last year, “competition in the politics industry is failing America” (Harvard Business School, 2017). Polarization stems from the two-party arrangement trying to outdo each other by distorting the rules of the game in their favor, through gerrymandering, political funding and putting partisan interests above public interest. The capture of party politics by vested interests has corrupted democratic governance across the world, with growing discontent from rising social inequality. When the politicians refused to deal with the global financial crisis of 2008 by letting off bad bankers and solving it instead by printing more money, the result was rising asset prices and even greater social polarization. Once technology and migration threatened jobs, the populist vote for change moved further to both the right and left. The biggest casualties from the crises were not financial, but political, with loss in public trust in the system as a whole. When “fake news” is being thrown around, no one knows who to believe anymore. The Edelman Trust Barometer, which is an online survey in 28 markets with 33,000 respondents, suggested that in 2017 trust was in crisis and in 2018, there was the battle for truth. Interesting enough, among the general population trust in institutions (nongovernmental organizations, business, government and media) was highest in China, Indonesia and India, whereas trust in US institutions has fallen 9 percentage points from 52 percent to 43 percent. What was scary was that trust in US institutions among the informed public has fallen 23 percentage points from 68 percent to 45 percent. The US general population had a 30 percent loss in trust in the US government, whereas the fall in trust by the informed public was much less at 14 percent. The US trust in the media was along party lines, with only 27 percent of Republicans trusting the media. This capture of the state by the market was simultaneously accompanied by corruption of the market by politics in supporting even greater concentration in markets. Funding democratic politics is expensive, with the last US presidential elections costing $16 billion. And since government spending comprises 38 percent of gross domestic product, it was not surprising that businesses seek to influence policies through lobbying and political funding. Consequently, competition in business also became corrupted by competition in politics, with growing concentration in market power. This trend can be seen in many countries. An illustration why even professional institutions are now failing the public interest through lack of competition is in the audit profession. The audit of corporate information is a public good because fair, reliable and timely information is the lifeblood of markets. Many of the recent corporate failures, which can only increase as the world enters into a recessionary period, were due to false and misleading information disclosure. If we cannot even trust basic accounting information, how can investors trust markets? Amid all the noise of Brexit, the British Competition and Markets Authority has published a consultation paper on how to reform the British audit profession. Earlier in the year, the British government commissioned the Kingman report on the Financial Reporting Council’s role in setting the governance standards for UK companies, including the quality of audit work on the corporate financial accounts. The Kingman report essentially suggested that the old Financial Reporting Council does not have the powers and resources to do its job properly, since it is funded by the audit profession, and not “where necessary feared by those whom it regulates.” Since the Council still smacks of the old self-regulatory structure, the report recommended the replacement by a fully statutory body, with full powers to do the job properly. The CMA has finally tackled the unsustainable position of only four audit firms accounting for the audit work of 97 percent of FTSE 350 companies, compared to eight firms in 1987. These audit giants were widely criticized for many corporate failures in the wake of the 2007 global financial crisis, but their regulators were always concerned that if any one of them were sanctioned to the degree of failure, the concentration would be made worse. In its 2018 Audit Quality Review, the FRC found that there was a decline in quality for audit work by all of the Big Four, and an “unacceptable deterioration” at one of them. Indeed, the Big Four earned 79 percent of their revenue from nonaudit services, which means that there is an underlying tension between profits from providing high quality audit services versus profits from nonaudit services. The proposed reform involves splitting the audit and non-audit business at the big audit firms, and an innovative “joint audit regime” for FTSE 350 companies. This means that one of the joint auditors will be from the smaller audit firms outside the Big Four. These reforms suggest that the public agenda is finally shifting towards competition failure as one of the major causes of our present dilemma. If you think about it, in almost every field, competition is now between a handful of giants, be it 5G telecoms, finance, health care, technology, news media, geopolitics or even national parties. The outcome of such “managed competition” often are at the expense of the less privileged. Some may call these behavior predatory for the uninformed consumer. Even in climate change policies, there is greater awareness that failure to tackle climate warming is hurting the poor and rural areas more than anyone else. The old rules of competition are clearly broken, but there is no clear way of how we can change these rules and who can enforce them fairly. The market is not working for all, but is the state the right institution to fix these problems, especially if it can be biased by the few? That is why the New Year brings new dangers, and for the optimistic, new hope for change. 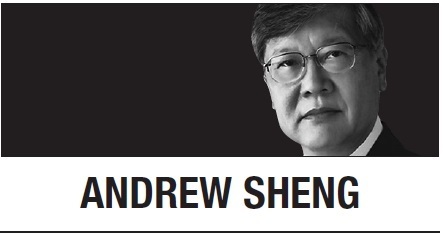 Andrew Sheng writes on global issues from an Asian perspective. -- Ed.